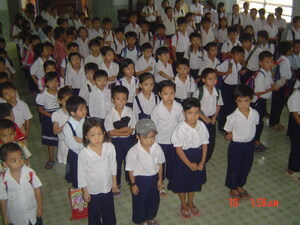 Before Father Nguyen Van Lap passed away in 2001, he organized classes for orphaned, homeless, disabled, abused children who ages range from 6 to 10 in Binh Trieu parish, VietNam.Through the generosity and support of Dalat's former professors and classmates, the NVLEF has been merged into the Dalat University Alumni Charitable Trust (DUACT) in order to expand educational and charitable activities on a larger scale. The NVLEF was the name given to the cottage-type of learning spot initiated by our beloved Father Monsingor Nguyen Van Lap, a former Rector of Dalat University, who, out of compassion for the desperate children around Binh Trieu area, would like to provide them with very basic education-reading and writing-after their peddling, begging, shoe shining duties to supplement the meager income of their poor parents. Some of them are homeless or orphans. The main goal is to get these very young innocent boys and girls out of trouble in the middle of dark society surrounding them with all kinds of temptation and vices. But the most important intention is to break away from the vicious cycle of ignorance, poverty and illiteracy. With education, these children will surely be able to get out of the cycle to become productive citizens. From 2003 DUACT continues to support the NVLEF with an annual subsidy of between 4,000 to 6,500 USD to maintain 5 classes from Preschool to Fourth Grade to benefit an average of 200 students enrolled. Every year, there are about 30 students successfully graduated from the NVLEF's School of Compassion to go on to enroll into Fifth Grade at mainstream local public school. The school children are provided uniforms, regular meal suppliments and school supplies among other sporadic assistance when needed. The instructors receive nominal stipends for their dedication. In 2007, the school is equipped with a computer system to improve its administrative system. Currently, the school is well managed by a qualified administration team composed of Rev. Lieu, Sister Duyen at local Binh Trieu Catholic Church and Mr. Nguyen Van Quan, our DUACT project coordinator.